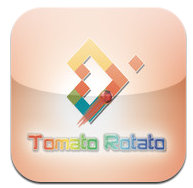 Tomato Rotato — Mobers.ORG — Your Daily Source For Mobile FUN! Tomato Rotato is a challenging hyper speed tomato based twitch-em-up! Attempt to roll on the cubes whilst rotating the world to pumping music. Don't become a 'squashed to-martyr'! - Dynamically generated levels, infinite amount of level design possibilities. - Simple 2 button control system!